The complete digestion and absorption of a meal can take several hours, depending upon its size and composition. Therefore, carbohydrate or more specifically glucose from that meal may be available for several hours as well. However, once this ends, a new blood glucose scenario begins to take shape. 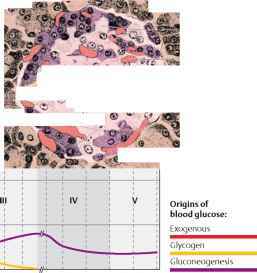 Cells throughout the body will continue to help themselves to glucose in the blood to help meet their energy needs. The net effect is that our blood glucose concentration will begin to decrease. When this happens the pancreas responds again. However, this time it responds by releasing the hormone glucagon into our blood (see Figure 4.3). In addition, epinephrine (adrenaline) and cortisol will promote efforts in different tissue that will help maintain blood glucose levels in-between meals.